If you love to fish then you need a float tube to hit those remote and untouched fishing spots. Many anglers won’t touch a body of water without a boat landing. And a sparse few will bother with making a short hike to test a backwoods trout pond. A float tube is an amazing watercraft for all those purposes and more. There are a number of different float tube models on the market. Each has its own strengths, weaknesses, and unique features, but some are obviously just better designed than others. That is why Fly Fishing Atlas brings you our review of the best fishing float tubes. We are big fans of comfortable float tubes with a good set of useful features. We want to help you find the right boat at a great price. We review some of the best and most affordable float tubes to help you find the right one. We go over each one in detail below, but here are our top picks for those in a hurry. Comfort – Float tube fishing can either be crazy comfortable, or very uncomfortable. Fishing in a float tube for an extended period of time has a way of bringing out the weak points. Good back support is essential when you want to lean back and relax. A fairly rigid seat bottom, whether inflatable or foam, makes a huge difference as well. We suggest avoiding the “sling-style” seats, which are just a fabric sling and tend to compress your hips. Ride Depth –Float tube fishing that provides a higher riding seat is nice when the water is really cold. But high seating provides other benefits as well. The higher you ride, the faster you will be able to move around the water. This is another reason to avoid sling-style seats. Sling seats force you to propel yourself through the water as well as the float tube. That can become tiring very quickly. Weight Capacity –How much weight you need the float tube to hold is going to depend on your weight plus the gear you want to carry. Float tubes with a higher weight capacity will usually help you to ride a little higher as well. Helpful fishing accessories like fish finders and backpacks might not be easily accommodated with smaller models. Hike-in Friendly – If you might need to hike to a remote area, then you should look for a few features before you make a purchase. Does the float tube come with D-rings to attach backpack straps? Does the float tube come with backpack straps? You also won’t be able to wear a backpack with a float tube on your back, so available storage in the pockets of the float tube will be important. Our top choice for best float tubes under $250 has to be the Cumberland fishing float tube from Classic Accessories. Classic Accessories is a US-based company in Kent Washington and has been in operation since 1983. The Classic accessories brand is well-known in the fishing community. 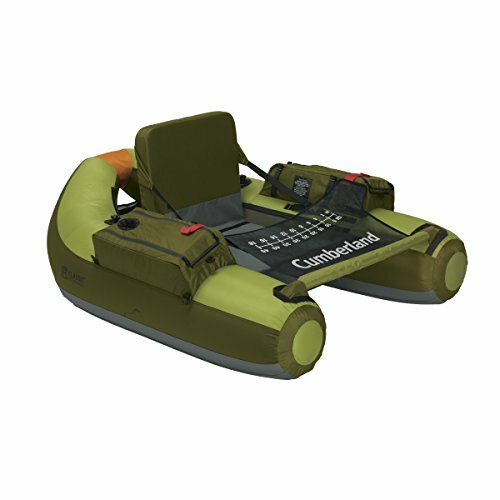 The Cumberland float tube is an amazingly comfortable watercraft. The thick padded seat and supportive seat back make a day on the water enjoyable so you can concentrate on fishing. The Cumberland features two large cargo pockets with easy-open double zippers mounted topside of each pontoon. Classic Accessories has designed each cargo pocket with its own drink holder as well. Additional storage is available on the rear of the backrest in the large mesh stuff pocket, which features a drawcord closure and two interior zip pockets. Other beneficial details include the mesh stripping apron with fish ruler. A rugged PVC bottom provides abrasion resistance and safeguards from puncture. The Cumberland also includes adjustable backpacking shoulder straps. Classic Accessories rates the Cumberland for up to 350 lbs. The online reviews for the Classic Accessories Cumberland float tube are overwhelmingly positive, with 95% of the reviewers giving it 4 or 5 stars. Phrases like “light and very portable to hike with”, “maneuvers with ease”, and “built like a tank” are common accolades and easily make this one of the best float tubes for the money. The only downside in our eyes is the lack of padding on the backpacking shoulder straps. The straps are easy to use and won’t be troublesome for shorter walks. But if you plan on hiking longer distances and shoulder padding is one of your must-have features, you might want to consider adding shoulder strap pads. But despite that one very minor shortcoming, we feel the Cumberland float tube from Classic Accessories is a fantastic fishing float tube for an amazing price. Our second choice of best fly fishing float tubes under $250 is the Outcast Fishcat 4-LCS. Outcast produces a diverse line of watercraft. And from personal float tubes to large fishing rafts, the Outcast name is synonymous with the highest quality of inflatable watercraft. The Fishcat 4 carries on that fine tradition, delivering solid build quality and a stable platform to cast from. The Fishcat 4 comes with a thick foam seat with an adjustable foam backrest. Outcast has provided the option to swap out the foam seat for an inflatable seat if desired. Preference varies, but we prefer the foam seat over the inflatable version due to the higher ride it provides. But an inflatable seat is less bulky and can be deflated for the sake of easier hiking. 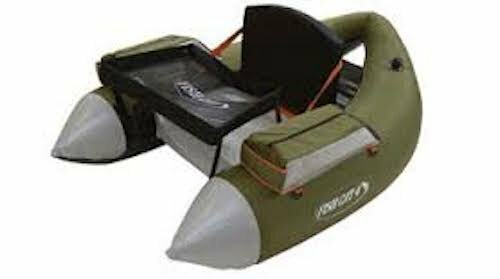 That should be a consideration if you are looking for the best fly fishing float tube for easy hiking to remote locations. The Fishcat 4 features rugged, puncture resistant pontoons manufactured by the top-notch air chamber producer, Aire. Aire has a reputation for excellence in the world of inflatable watercraft. The Fishcat 4 features two roomy cargo pockets with centered zippers mounted on top of each pontoon. The online reviews for the Fishcat 4 are very positive, with 89% of the reviewers giving it 4 or 5 stars. Reviewers laud the comfort and quality of the Fishcat 4 with comments like “ floats very high”, “fastest float tube I’ve ever used”, and “one of the top tubes for a reason.” There is no denying that Outcast is one of the best float tube designers in the world. 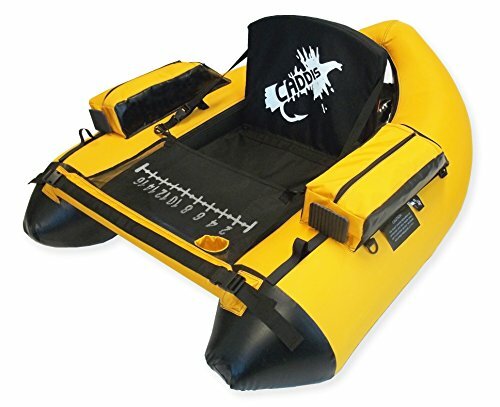 The few drawbacks of the Fishcat 4 are that it is missing drink holders, a seat back mesh pouch, and backpack straps are not included with this float tube. However, Outcast offers these shoulder straps available from Amazon.com and D rings are located under the seat to provide backpack strap attachment points. The LCS-4 includes an excellent mesh stripping apron with fish ruler. Outcast also rates the Fishcat 4 with a 250 lb load capacity, which is a fair amount lighter than some of its competitor float tubes. But the quality construction and competitive price make the Fishcat 4 worthy of consideration if you are in the market for a float tube. The Caddis Premier Plus float tube is our third selection in this review on best fishing float tubes under $250. 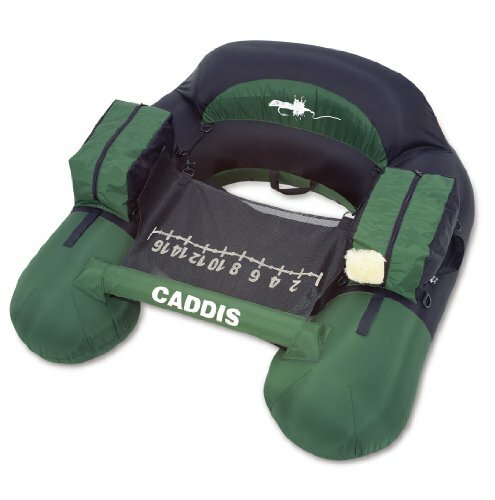 Caddis Sports has been in the float tube game for a very long time. Their float tube designs have had an unmistakable influence throughout the field of watercraft manufacturers. Caddis float tubes have earned a strong reputation for many years of service. The upper portion of the float tube is made from heavy duty rip-stop material for durability. The belly of the boat as well as the front of each pontoon has a rugged construction made from tarpaulin to resist puncture and abrasion. The seat bottom is a thick dense foam and the adjustable backrest keeps your back supported well. Two large main equipment pockets provide significant storage capacity. The quick filling Boston valves are located within the main storage pockets as well, which slightly reduces the available storage space. Two dry fly patches have been placed on the front face of the storage pockets. The stripping apron features a built-in recessed drink holder and a stabilizing bar. Caddis does not include shoulder straps with the Premier Plus, but you might consider trying the Outcast Backpack Straps. D-Rings are available for convenient transport. Caddis lists the maximum weight capacity at 325 lbs. The Premier Plus shows a very good reputation online with 88% of the reviewers giving it 4 or 5 stars. Reviewers regularly comment on the price and quality of the Premier Plus. Contributors frequently make comments like “what a deal” and “built excellent.” That level of confidence is really what you’re looking for in a float tube. There are a few trivial shortcomings of the Premier Plus. One misstep is that the Boston valves occupy precious space within the main storage compartments. The other oversight is the lack of a large storage pocket on the rear of the backrest. The minor storage blunder can be remedied easily with the addition of a dry bag to place in the mesh storage area. Despite a few possible improvements, the Caddis Premier Plus is overall a great float tube to keep in mind when you are looking for a capable float tube that is priced really well. 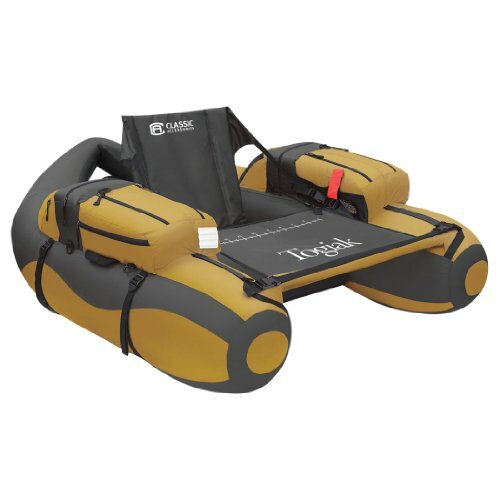 Our fourth pick for best float tubes under $250 is the Togiak from Classic Accessories. Classic Accessories built another top float tube with a fantastic price tag in the Togiak. Our Togiak float tube review revealed the design to be back-packable, float high, and is extremely stable. Classic Accessories designed the hydrodynamic hull of the Togiak float tube to be a solid and comfortable fishing platform. The design is super buoyant while also being remarkably steady because the tube strikes the balance between width and length without being too large. The tough nylon covering sports a sleek looking black and brown color scheme, but also provides for a great deal of storage. Comfortable armrests provide fantastic storage options with additional pockets for extra reels and gear, as well as small mesh pockets and flat zip pockets. The seat of the Togiak is a thick foam insert that gives the angler a good platform to cast from. The seat back is comfortable for a variety of anglers because the stadium style design includes adjustment straps that provide for a wide range of settings. Some report these straps can slip, though we haven’t seen that. The Togiak is also rated to carry up to a 300 lb capacity. Online reviewers of the Classic Accessories Togiak frequently leave comments like “The Togiak is roomy,” “VERY impressed by how tough it seems,” and “easy to backpack.” The Togiak shows an overall good reputation with 76% of the reviewers giving it 4 or 5 stars. A few reviewers also made mention that the Togiak comes standard with backpack straps, which is obviously a nice perk. As we noticed with some of the other tubes, the Togiak is lacking drink holders. But with all the ample pocket storage it is no challenge to imagine an arrangement that would accommodate a drink or two. 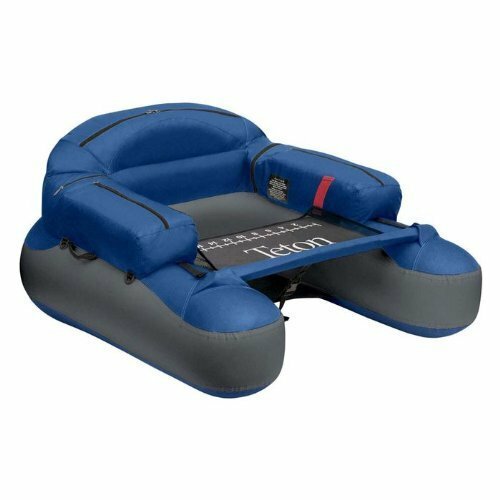 The Togiak from Classic Accessories is a comfortable and roomy option to look at if you are looking for a float tube with a reasonable price. 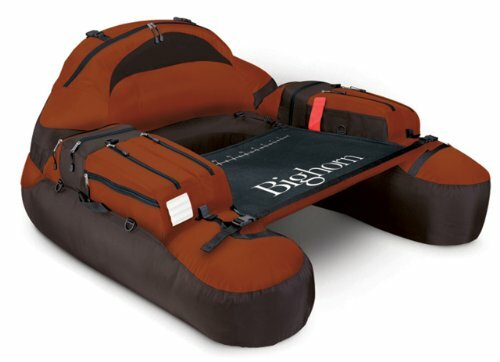 The Caddis Pro 2000 is our fifth place finisher for best fishing float tubes under $250. The Pro 2000 is another offering from Caddis. Unique designs and innovative ideas have kept Caddis float tubes in high demand year after year. 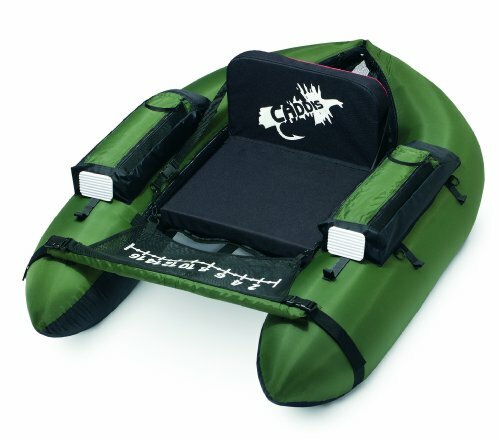 The outer shell of the Caddis Pro 2000 float tube is made of rugged nylon. All critical seams are double-stitched to bolster the strength of the shell. The pontoons feature a unique low-profile design that Caddis touts as increasing stability. The seat is a 2 inch dense foam insert that helps the angler to sit close to the surface of the water. The Caddis Pro 2000 also features a 2 inch thick foam backrest that includes convenient adjustment straps. We thought it was worth noting that the backrest is somewhat short in stature compared to our other examples. Two main equipment pockets are located over the pontoons on both sides of the seat. The main pockets provide substantial storage space. Large double-pull zippers make it easy to open the pockets with one hand. Two boston valves are located within the pockets which makes inflating the pontoons very quick. Two fly patches are located on the front face of the storage pockets. These patches are great for keeping your favorite fly patterns accessible, or for drying out flies before storage. A large stripping apron features a stabilizing bar and a fish measuring ruler for when you land a big one. Caddis also includes backpack straps with this model. If you like to hike a fair distance we recommend adding this shoulder strap pad for the sake of comfort. D-rings are located under the seat and easily attach to most backpack straps. 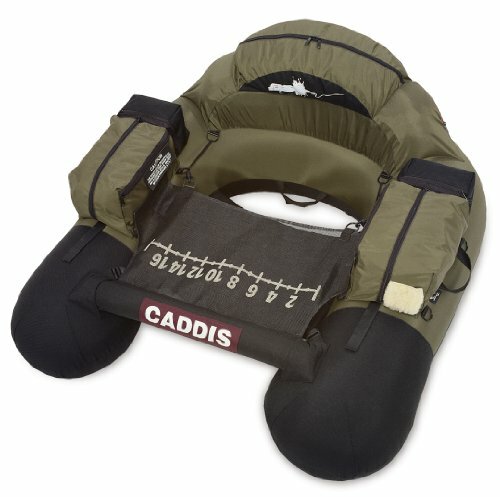 Caddis lists the maximum weight capacity at 250 lbs. The Caddis Pro 2000 fishing float tube shows a fairly good online reputation with 82% of the reviewers giving it 4 or 5 stars. Reviewers frequently leave comments like “built very tough” and “Easy to inflate.” Some reviewers described the seat back as not being very supportive. We also noticed a lack of drink holders. But it is worth noting that drinks could be placed in the other storage areas. Overall the float tube is a tremendous value. The Caddis Premier Plus is a wise option to consider if you are looking to invest in a fishing float tube with very reasonable price. Uniquely designed low-profile pontoon-styled floats enhance performance and stability. Outer shell made of nylon packcloth and double-stitched on ciritcal seams. Stable U-shape designed tube is easy to navigate and provides a very comfortable ride with a suggested 225lb weight capacity. The Nevada/Gold outershell is the new rip-stop stlye nylon upper and a heavier cordura bottom and ends for even more durability. Padded stabilizer bar adding to the stability of the float tube.